Seal Sitters: Share the Shore from EarthFix on Vimeo. The Pacific Northwest has many marine mammal species- Orca, whales, dolphins, porpoises, and several Pinnipeds, including seals and sea lions. One of the most common is the Harbor seal (Phoca vitulina). Harbor seals live year-round throughout Puget Sound, and can be seen swimming about near docks, beaches, ferries, or waterfront restaurants. 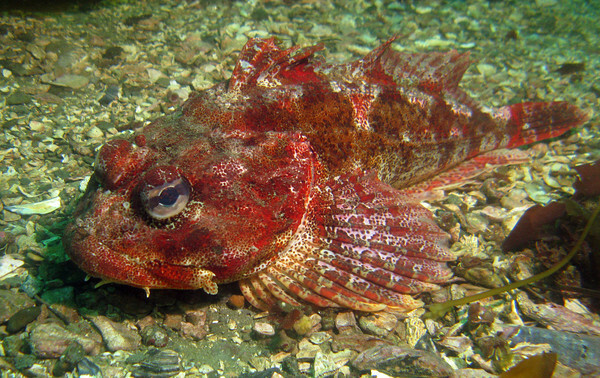 They eat sole, flounder, sculpin, cod, herring, and even occasionally a Giant pacific octopus. Starting in July each year, female harbor seals congregate in rookeries to give birth and rear their young. Harbor seal pups are born alert and can follow their mother into the water immediately after birth. Harbor seal mothers nurse their young for 4-6 weeks until they are weaned. Mother’s milk is rich and nutritious, containing 50% milk fat. Mothers will occasionally leave a pup on the beach while they forage for food. These pups are not abandoned and should never be approached or moved, as activity around the pup could cause the mother to abandon it. The first year after weaning is a rough time for Harbor seal pups as they must learn to forage for food by themselves while relying on fat stores from nursing to keep their energy up. During this critical first year, Harbor seal pups need to rest on the beach and warm up (called hauling out) for up to 12 hours per day. They can be easily scared back into the water by human activity on the beach, causing them to waste energy instead of resting and warming up. Current guidelines are to stay away at least 100 feet from a marine mammal, including resting seal pups. At Puget Sound dive sites, scuba divers should be alert for Harbor seal pups resting on the beach, keep their distance from the pup, and notify the local marine mammal stranding network so that volunteers can come out to watch the pup. 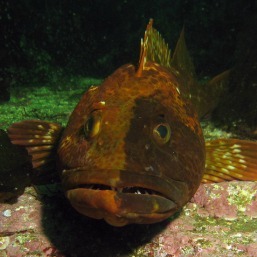 For West Seattle dive sites and beaches, contact Seal Sitters at (206) 905-7325. For other locations, call the NOAA marine mammal hotline at (800) 853-1964. One of the best parts of a night dive are the different animals that come out in the evening hours. Our night dive last week had Harbor seals join us for most of the dive, using our dive lights to hunt for invertebrates. Harbor seals are fairly common marine mammals in Puget Sound with healthy populations. The can be brown, tan, or grey with spots on their back or underside and weight up to 290 pounds. Harbor seals are “true seals” meaning that they do not have ear like Sea lions do. Harbor seals do not migrate and will live their entire lives within a several square mile area. Our Puget Sound Harbor seal pups are born in late summer and are weaned from their mother after just 30 days. Diving with Harbor seals can be exciting and a bit nerve wracking at first, as divers get used to having a large wild animal swim along side and dart out in front of them. Harbor seals also tend to swim up from behind divers, so that they are not noticed until you see them out of the corner of your mask. Once divers get used to having Harbor seals in the water, it quickly becomes an entertaining and memorable dive experience. Ready to schedule your night guided dive tour, night PADI Adventure Dive, or PADI Night Diver certification? Book your tour online, call us at (206) 265-0006, or e-mail to get started today! 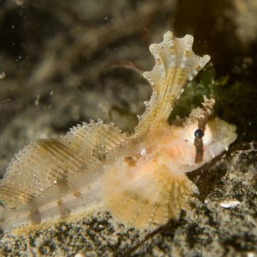 Have you thought about a night dive but just weren’t sure? Here are some great reasons to get you in the water at night! During a night dive, everything takes on a new look. Your focus changes as you move about the dive site, observing life around your dive light and seeing ambient light from the surface. At dusk and again at dawn, nocturnal and diurnal species “trade places” on the dive site to seek food and engage in social activities. 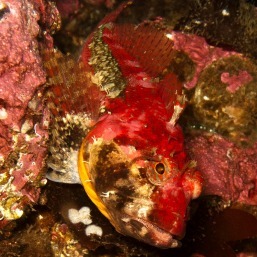 Rockfish seek out holes and ledges in the reef to sleep while other fish species, such as Ratfish, become more active. 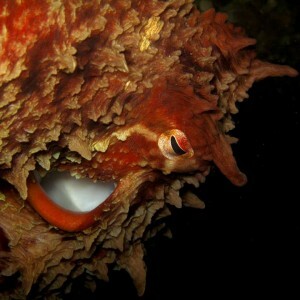 Our famous Giant pacific octopus is also more active at night, sometimes venturing out of their dens to hunt for food. Harbor seals are especially enthusiastic, occasionally following divers around Puget Sound dive sites and hunting using diver’s lights to illuminate prey. Even a familiar dive site can look completely different at night. Wrecks and small boats underwater become compelling and mysterious. Reefs light up with your dive light and display colors not seen in the daytime. During the fall, billions of small microorganisms in Puget Sound become excited by water movement, which causes light emission in the microorganism. While on a dive safety stop, simply point your light down or towards you (for safety, do not turn your light off) and wave your free hand in the water. You’ll see thousands of light pinpoints, an amazing experience to end your dive. The PADI Open Water Diver course taught us that colors degrade underwater, first starting on the red end of the spectrum. 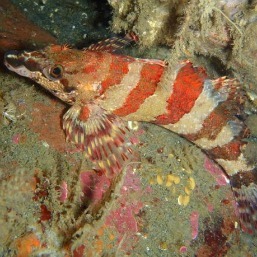 A dive light can bring back the “true” colors of fish, invertebrates, and corals. 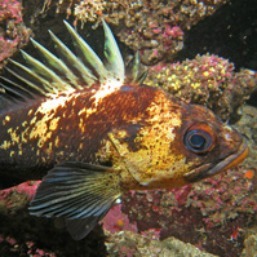 Vermilion rockfish (Sebastes miniatus) become a beautiful red, Stubby squid (Rossia pacifica) can turn red to deep purple, and California sea cucumber (Parastichopus californicus) reveal their deep reddish-orange to yellow colorings. Go diving after work or even later in the day. Night diving is great way to squeeze in a dive after work or in the evening hours. We offer night dives every day of the week, and they can be scheduled anytime after sunset. A night dive is a perfect option for visitors to Seattle with a full daytime schedule of meetings, conferences, or even just sightseeing. Ready to schedule your night dive tour, night PADI Adventure Dive, or PADI Night Diver certification? Book your tour online, call us at (206) 265-0006, or e-mail to get started today! Second to Harbor seals, California Sea Lions are the most common Pinniped that we see in the Northwest, with a total population of over 300,000 ranging from the southern tip of the Baja peninsula in Mexico to as far north as Vancouver Island in British Columbia. Some of these will choose to spend late summer through early spring in Seattle, feeding and resting in front of downtown in Elliott Bay. California sea lions (Zalophus Californianus) are closely related to two other sea lion species, the extinct Japanese sea lion and the endangered Galapagos sea lion. California sea lions can weigh close to 1,000 pounds and grow to 7 feet in length, while their fur color can range from gold to a dark brown color. They can live for up to 30 years in the wild, reaching sexual maturity at around 7-9 years. Unlike “true seals“, sea lions have external ear flaps and can move on land with their hind flippers. In the spring, male California sea lions migrate down to breeding rookeries in the Channel Islands National Park. Females do not migrate and stay near their rookeries year-round. Once females give birth, they will nurse pups for up to 1 year, with females sometimes leaving their pups for up to 3 days while foraging at sea. After breeding season, males will head back north until next spring. California sea lions feed on a wide variety of fish and invertebrates, mostly foraging around coastal areas and sea mounts. They have been known to swim as far as 280 miles out to sea and can dive to depths of over 500 feet while remaining submerged for up to 10 minutes. They can also slow their heart rate to stay underwater longer. 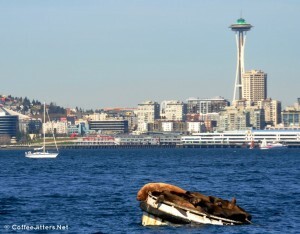 While resting and basking in the sun off the Seattle waterfront, sea lions keep a watchful eye out for their main predator, Orca. Resident Puget Sound Orca pods are focused on eating salmon and are not interested in sea lions, but transient Orca pods will travel into Puget Sound to hunt for seals, sea lions, Grey whales, and other marine mammals. California sea lions also need to keep a watch out for sharks while in the open ocean, as they will ambush them while resting on the water. Due to their increasing population numbers, California sea lions are not considered threatened wight he help of the Marine Mammal Protection Act of 1972. Their main threats are now conflicts with fishermen, entanglements with garbage, and the killing of sea lions near the Bonneville Dam in the Columbia River. We wish our California sea lions a safe journey back down to the Channel Islands, and look forward to their return to Puget Sound later this summer! Followers of our blog, twitter, and Facebook posts have heard us mention the Harbor seals that frequently accompany us on our night dives, especially at Seacrest Park Cove 2. Here’s a video from last week taken by Northwest diver Ben Hollis and Seattle Dive Tours Divemaster Chen Hsu. Harbor seals are common in and around Puget Sound, and are one of the most widely distributed Pinnipeds in the world. Harbor seal pups have historically used the beaches in West Seattle to haul out, rest and warm up between foraging sessions in the water. 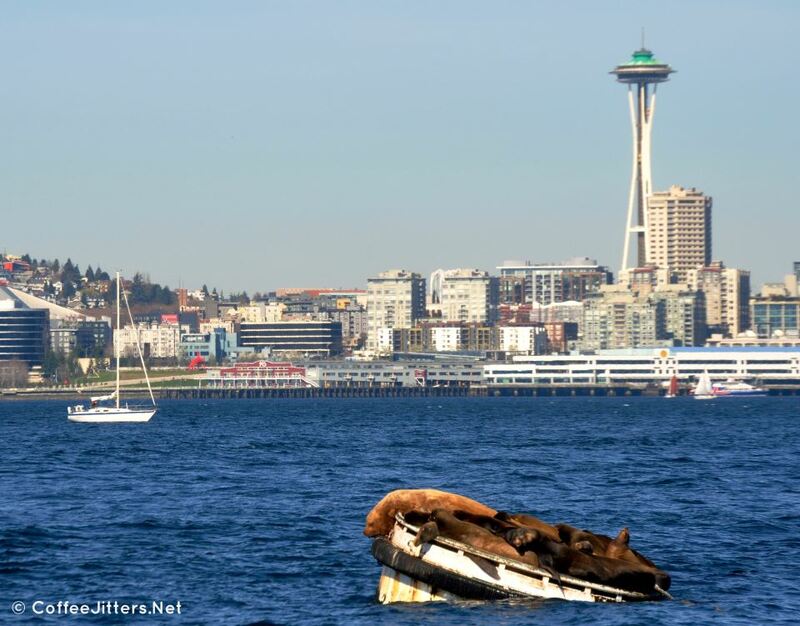 Harbor seals don’t migrate like both the California and Stellar sea lions that our dive tours often see resting on the navigation buoys in Elliott Bay, and instead our local Harbor seals live their lives in the Northwest.